Happy Friday, all. 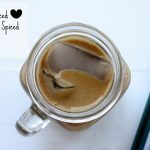 As you settle into your weekends, I’m happy to share a healthy, sweet, and delicious alternative to plain almond milk, or hot cocoa, or whatever warm beverage you prefer in these chilly months. It’s turmeric milk, which I whipped up during and after my little bout of flu, and it’s now one of my favorite homemade drinks. If you’re lucky, you can find fresh turmeric root at your local Asian market or even at your neighborhood health food store, and then you can juice it or grate it into your smoothies. But using powdered turmeric is also an easy way to incorporate this wonderful ingredient into your diet. I put turmeric into curries, soups, and stews. 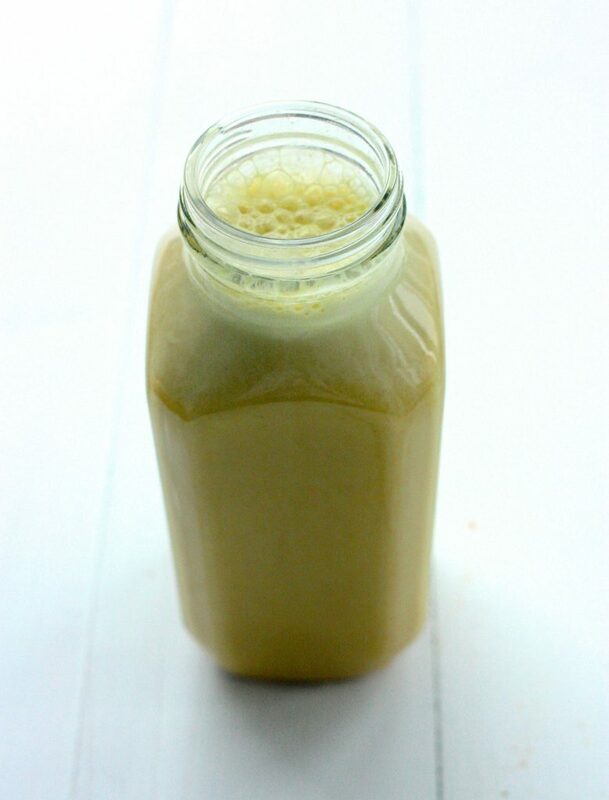 But since it compliments sweet flavors well, I recently decided to try it in a batch of my homemade almond milk. I loved the results, and I hope you will too. Blend all ingredients together in a blender. Transfer the mixture to a small pot and heat gently, stirring often. Serve warm. 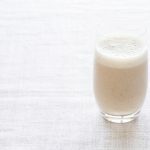 Homemade almond milk really does make this recipe special, but any commercial non-dairy milk is fine here. And of course, you should adjust sweetness and seasoning to taste. Enjoy the beverage. And enjoy your weekends! I’ll be back on Sunday for some overdue weekend reading. Can’t wait to round up some great recipes and reads for you all. 1. Sahdeo Prasad and Bharat B. Aggarwal, Herbal Medicine: Biomolecular and Clinical Aspects, 2nd Edition. CRC Press, 2011. 13.1-13.9. 2. Bundy R, Walker A. F, Middleton R. W, Booth J. Turmeric extract may improve irritable bowel syndrome symptomology in otherwise healthy adults: A pilot study. J Altern Complement Med. 2004;10:1015–8. 3. Hanai H, Iida T, Takeuchi K, Watanabe F, Maruyama Y, Andoh A, et al. Curcumin maintenance therapy for ulcerative colitis: randomized, multicenter, double-blind, placebo-controlled trial. Clin Gastroenterol Hepatol. 2006;4 (12): 1502–1506. 4. Lahiff C, Moss AC. Curcumin for clinical and endoscopic remission in ulcerative colitis. Inflamm Bowel Dis. 2011;17(7): E66. 5. Aggarwal BB, Sundaram C, Malani N, Ichikawa H. Curcumin: the Indian solid gold. Adv Exp Med Biol. 2007;595:1-75. I’m excited to give this a try. It’s so cold right now, a warm and soothing beverage is perfect! I love turmeric milk! 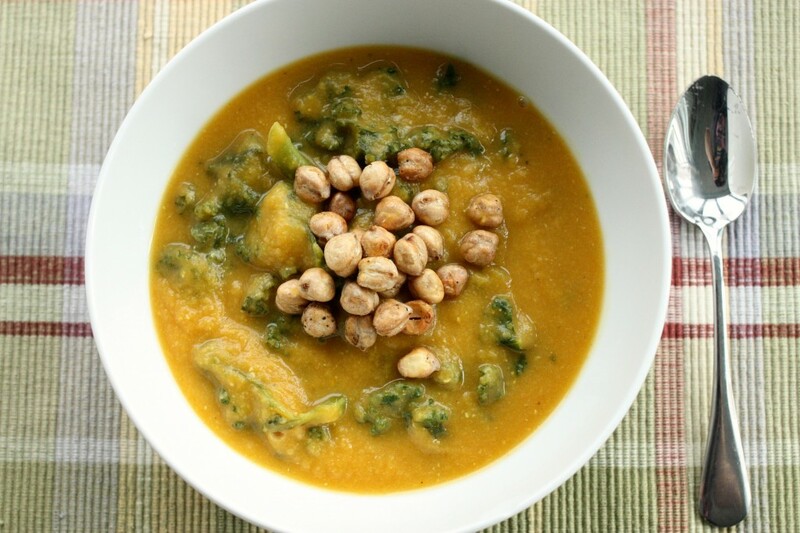 I make a similar recipe using fresh turmeric, when available, grated in and a pinch of black pepper, which is supposed to work synergistically with the turmeric. Yummm I just made a sort of spiced tea inspired by this post. 1/4 tsp tumeric, ginger, and cinnamon, a bit of agave, all mixed together with boiling water and topped off with almond milk. I’m gonna have to start putting tumeric in my oatmeal, it’s really good! wow…never ever have I thought that! Sure looks yummy! I” givi it try! i definitely need to make that pate..i got these great coconut wraps from julian bakery and i think they would be perfect on those! i’m trying to eat 1. as little protein as possible this week 2. as many veggies as i can stand because i’ll be in japan soon and will prob be having lots of rice/fish. too much protein is never a good thing for my digestion but i know it’s ‘safe’ for me to have as a celiac who can’t read kanji! I can imagine this being delicious. My local hfs sells fresh turmeric and this post might be the motivation I need to finally pick some up! i stumbled upon fresh turmeric a couple of months ago and since that day I’ve been drinking fresh turmeric and ginger tea, but I had not tried to add some milk and drink it as chai. I also replace fresh grated root in recipes that call for dried turmeric powder, as I doubt there’s much medecinal properties remaining in a powder that is not very fresh! I cut the root in cubes that I freeze and use this , in tea or grated. Perfect timing Gena. I just purchased some turmeric supplements because as much as I want to add it to my daily routine, I’m not crazy about the taste, at all. Supplements always seem so much less effective in my mind though but I was determined to get some of those wonderful anti-inflammatory benefits. 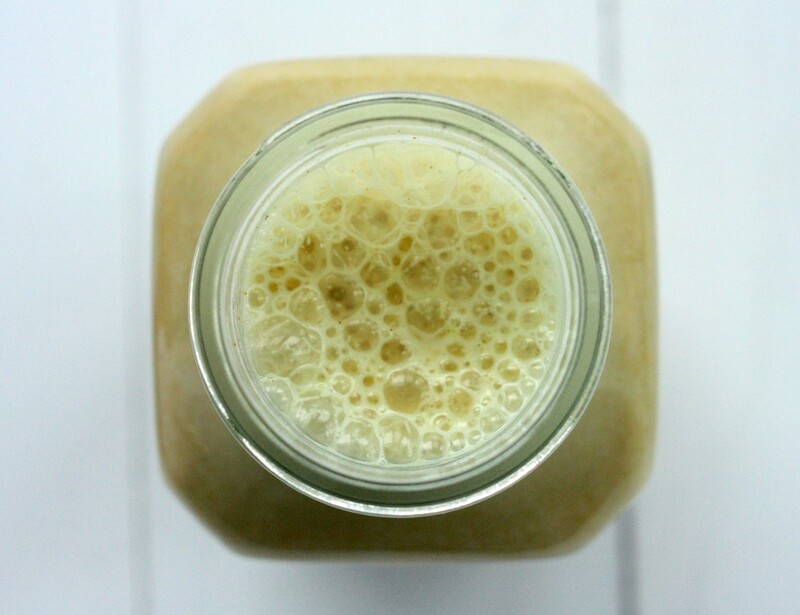 And voila………turmeric milk! LOVE! I’ll give this a try this weekend (Iove that it’s warm but I’m sure its great in smoothies too) and hopefully it’s my new source for turmeric. Do you have a strong preference to grated fresh over powdered? The fresh stuff I see in the shops doesn’t always look that appealing either. Awesome idea as usual. Thanks so much for getting sick (just kidding) and thinking of it for us 😉 Take care. Of course if I always could, I’d try to use fresh. But I think that the powder works well in recipes, and I’m sure that it must retain some of the beneficial properties. 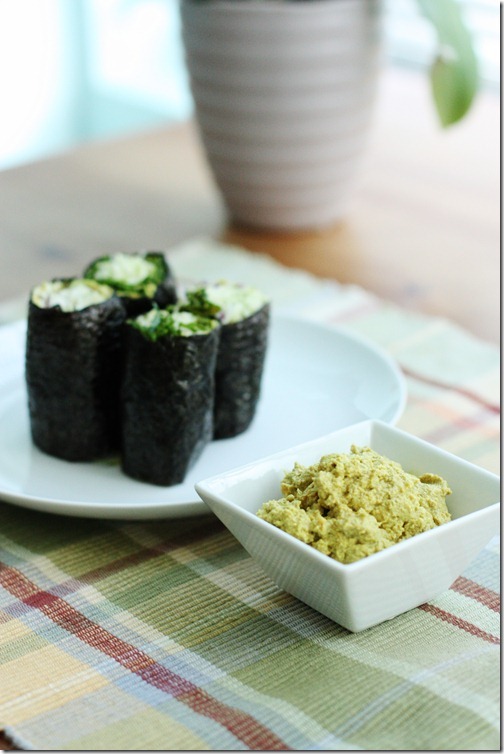 we love turmeric and love finding new ways to eat it!! This sounds wonderful! Everyone around me has been getting sick, so I think I’ll make this in an effort to ward off the bug. Oooh, good luck! It’s definitely that time of year. Excited to see your version. Because you mention Ayurvedic medicine I’m curious, what are your thoughts about it? I’m only familiar with the very basic concepts, but it would be interesting to hear from your perspective. I’ve never considered putting turmeric in a drink before (actually I’ve haven’t really used it ever aside from when it comes in my pre-made curry powder!) so this is definitely intriguing. It seems like it would be kind of a chai flavour. 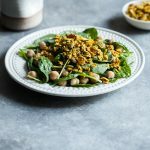 Thanks so much for this post – I had stumbled across some of the studies on turmeric and wondered about writing up a post but hadn’t got around to it and suspect it would have been a long time coming 🙂 I’m grateful to you for sharing the information instead and this gorgeous recipe too! Looove the color. This is so easy to make. Can’t wait to try it out. I’ve been meaning to make that dressing too. It’s on my mental to-do list! One of my favorite CR dressings. Get it, girl! 1.) There’s some evidence to suggest that the healing compounds in turmeric (including but not limited to curcumin–just like whole foods, whole herbs are always more than the sum of their isolated chemical constituents) are made more bioavailable in the presence of black pepper. Traditional Ayurvedic recipes often include turmeric with either long pepper (pippali) or black pepper, and it’s so fascinating to me that we’re now able to see why that’s advantageous biochemically. So if folks are using turmeric for medicinal purposes, including a little pepper might be a good idea. 2.) Like green leafy veggies, turmeric is an herb that can interact with blood thinning medications like Warfarin/Coumadin. If folks are taking blood thinners, they need to monitor their response to turmeric closely with their doctor and have their physicians adjust their meds as necessary. Thanks so much for this recipe and for helping turmeric to get a much-deserved moment in the spotlight. Thanks for sharing your expertise, Melanie! I’ll edit the post to incorporate these important notes. 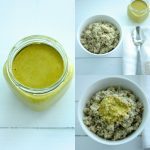 This looks great, I must try it and I’m a huge fan of using turmeric in recipes! Haven’t tried using the fresh root yet, but I really want to now. Thanks! I had this for breakfast this morning…..I think I had less stiffness in my arthritic left knee. Great recipe! Fantastic! I’m so happy you like it. I love juicing turmeric and putting it in savory dishes. What a great idea to add it to nutmilks. I’ll give it a try! I have to juice it more often! 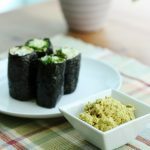 Always trying to find ways to incorporate turmeric into my diet…going to have to give this a try – thanks for the recipe! Hi Gena! Oh no! You had flu? I’m i India (yes, I made it) and haven’t been reading. So sorry to hear, but glad you are better. I love turmeric and at home I get the fresh stuff and use it every day for my yoga-challenged tissues. Here and in Ayurveda they call your drink “golden milk” but weirdly they won’t make it for me! Can’t wait to savor a cup when I get home. Wow, I miss my cashew milk! For now, hot lemon ginger honey water. Greetings from the other side of the world! Stay warm and well! Turmeric provides a stunning golden yellow color and I would love to give this ingredient a try in my next smoothies and nut milks, too. I used it only in curries, soups, stews and mac & cheeze. 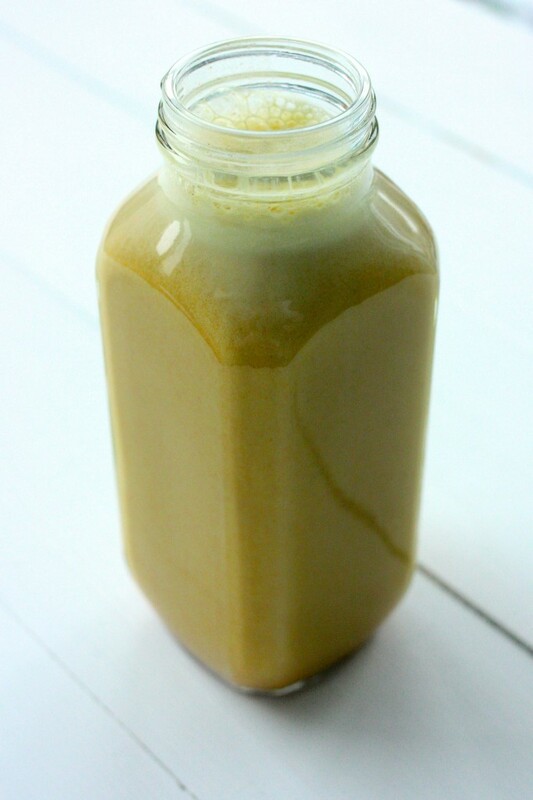 I bet the smell from your turmeric milk is wonderful…with the cinnamon and cardamon…miam! Ahhh what a stunning tahini dressing – with quinoa?! Brilliant way to use it! I hope you feel better from the flu! 🙂 Stay warm! Something I never would have thought of on my own…I’ll have to give it a try! That Tahini dressing looks amazing as well. Made this last night when I got in late from yoga class – really lovely. Thank you! Oh my! That tumeric milk is divine! I made some this morning because my knee (surgically repaired in September) seemed to be calling out for hydration and some lovely healing herbs. I heated it up at work and loved the sweet, chai-like flavor. Next time, I’ll decrease the ginger by half. I used powdered ginger and it was too much for my taste. Otherwise, a winner! That turmeric milk sounds amazing. Can’t wait to try it. Growing up, my mom used to make turmeric milk, but I never could stomach it. The combination of flavors and using non-dairy milk here, makes this one sound like a winner! I drink a cup of hot milk with a dash of tumeric and a tablespoon of pure maple syrup at night just before bed time. Heat it up real hot and mix it well and it is delicious. You see, when tumeric and pure maple syrup are heated it releases enzymes that are anti=inflammatory and that relax your muscles. You won’t believe how good you will sleep without aches! Does this mixture need to be heated or can I drink it raw? Thanks! Michael, you can definitely drink it raw! It’s delicious that way.